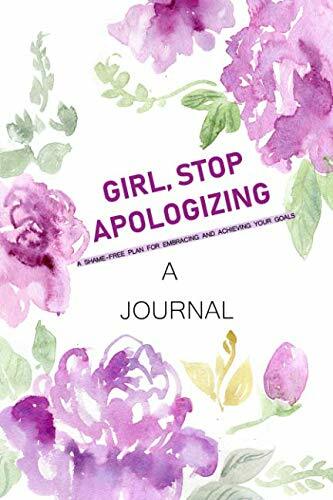 Complete beginners can begin using this Journal for Girl, Stop Apologizing A Shame-Free Plan for Embracing and Achieving Your Goals by Rachel Hollis to get immediate help of the major lessons and Quotes found in this book. The goal of this Journal is to help even the newest readers to begin applying major lessons from Girl, Stop Apologizing A Shame-Free Plan for Embracing and Achieving Your Goals by Rachel Hollis. Results have shown us that Journaling the Things your thankful for each day will help you achieve your goals. By using this Journal, readers will find Awesome and Life-changing quotes by Rachel that we believed were major in defining the crucial messages of the author in the book. There are Spaces to jot down 7 Dreams you made happen each day, also Space to jot down Goals you will achieve today. Take out a pencil, pen, or whatever digital technology you would put to use to jot down, implement, and make happen. And don’t forget to have fun – While at it. This Journal Will aid in your path to growth, confidence, and believing in yourself.